Prepare students, through a bilingual, bicultural, integrated curriculum, to be responsible citizens in an increasingly global and technological society. Yujin Gakuen Japanese Immersion School was the first public Japanese immersion school in the nation. Students are taught in Japanese 50% of the day and in English for the other 50%. 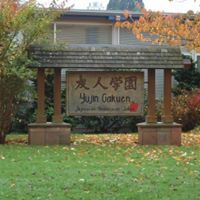 Roughly translated from Japanese, Yujin Gakuen means “happy garden of learning.” We serve students in grades K–5 in our building and have middle and high school programs at Kelly Middle School and North Eugene High School.